Has "very strong" multiplayer component. EA has toned down the gritty appearance of new SSX game Deadly Descents by dropping the subtitle. Deadly Descents refers to one of three key gameplay modes that EA was keen to shout about. The Deadly Descents are "all about survival gameplay" and outrunning "amazing" avalanches, rockslides and falling stalactites. 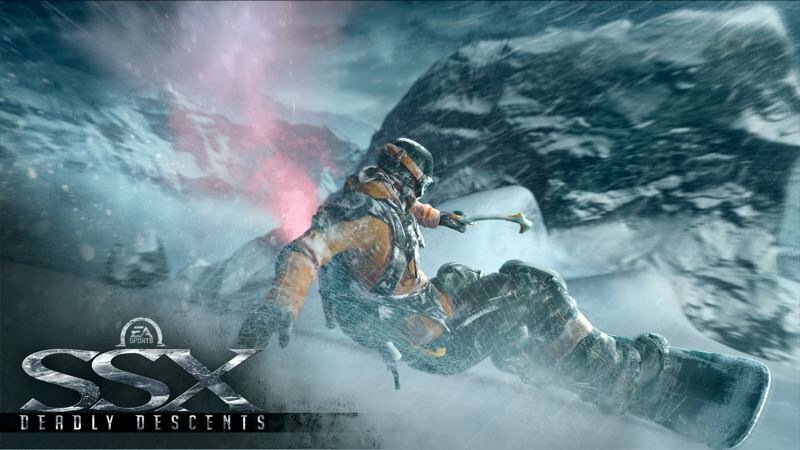 "But I've always thought racing was the core of SSX," creative director Todd Batty told Game Informer, "and we didn't want to go away from that, so we're going to have Speed Descent events and of course we'll have tricks in our Tricky Descent events. "We wanted to make sure we hit the over-the-top arcadey gameplay in all of these different gameplay modes. "We decided to lead with the new Deadly Descent gameplay in that trailer, but all of the classic SSX style will be there, too." The trick system of old is "fairly two-dimensional", Batty said. The hemmed-in, walled courses and the 'press a button to do trick animation' system are features that the new SSX will refurbish. "We want players to be able to ride off anywhere, at any time, and vault into the air at ridiculous speeds and heights," Batty said. "And we want players to be able to flip and spin and roll on any axis to create an infinite amount of tricks. Then we layer in all the grabs, kick flips, and all the other over-the-top tricks that SSX is famous for." Helping spruce up the old formula are new pieces of functional equipment, such as wing suits and pick axes. The former let you "jump into the air, do a bunch of tricks, pop open your wing suit and then coast across a 500-foot gap to safe landing", explained Batty. "You'd get a bunch of extra trick points for that." Ice axes, on the other hand, let you "do things like a vault move in Prince of Persia"; "Or say you jump across a chasm," Batty added, "and you almost make it but you slide off the edge - instead of falling to your doom you can smash those ice axes into the wall, vault yourself up and keep going." All of this will be underpinned by a control system influenced by XBLA golden child Trials HD, and brought into three dimensions with the help of the Fight Night Round 4 team. "It's actually a really easy system to use," reckons Batty. Batty went on to "confirm" that SSX will have "a very strong multiplayer component", but stopped short of offering details. "I wish I could talk about multiplayer because we have some awesome designs to share," he said, "but we're not talking about it now." SSX was announced during the Spike Video Game Awards in December, and met with scepticism from die-hard fans. "Where's our light-hearted trickathon?" fans bellowed. Batty sounds like he understands your concern. "There have been attempts to revive SSX over the years," Batty revealed, "different teams have put together different pitches for what a new SSX could be. But it just never felt like any of these proposals knew how to reboot SSX and make it relevant to today's market." PS3 gets Far Cry 3 Blood Dragon and SSX. Also MX vs. ATV Alive.